The Oakland Kajukenbo Kwoon Youth Program is traditional martial arts training for students from Kindergarten to 7th grade. Students progress from White belt to Black belt, building a powerful and practical skill set and deep connections with their training community. All weekday Youth Program classes are mixed rank, meaning all levels, from brand new students to advanced students, are training together. Every Youth Program class includes a vigorous warm-up, plus a combination of any of the following skill sets: Kajukenbo Kung Fu basics and applied basics; traditional forms practice; grappling; sparring; Eskrima; Northern Shoalin weapons; and Kajukenbo Kung Fu requirements for rank. Youth Program classes also include discussion of the history and philosophy of the martial arts and fundamental, age appropriate self-defense skills training. 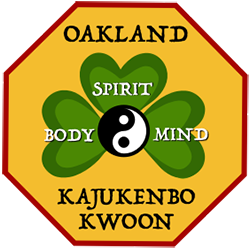 The Oakland Kajukenbo Kwoon Teen/Adult Program is a traditional martial arts training for students from 8th grade to adults. Students progress from White belt to Black belt, building a powerful and practical skill set and deep connections with their training community. All weekday Teen/Adult Program classes are mixed rank, meaning all levels, from brand new students to advanced students, are training together. Every Teen/Adult Program class includes a vigorous warm-up, plus a combination of any of the following skill sets: Kajukenbo Kung Fu basics and applied basics; traditional forms practice; grappling; sparring; Eskrima; Northern Shoalin weapons; and Kajukenbo Kung Fu requirements for rank. Teen/Adult Program classes also include discussion of the history and philosophy of the martial arts and fundamental, age appropriate self-defense skills training. Saturday class for three-year-old to pre-Kindergarten five-year-olds. Saturday classes for Brown and Black belts of all ages. Saturday Kajukenbo class for Blue and Green belts of all ages. Saturday class for Purple, Orange and White belts of all ages. Oakland Kajukenbo Kwoon will be holding a youth belt test and celebration. All Youth Program students are strongly encouraged to attend and support their training community on this challenging and fun day. Students testing is TBD. Oakland Kajukenbo Kwoon will be holding a Teen and Adult Program belt test and celebration. All teen and adult students are strongly encouraged to attend and support their training community on this challenging and fun day. The list of testing students is TBA. Pacific Association of Women Martial Artists annual training camp will be held at Aldersgate Retreat Center. More information is located about PAWMA and the camp is available on their website.